The return of the king! The Microtech HALO is one of the most iconic Single Action Out The Front knives on the market today, as part of the earliest Microtech lineup and surviving until today. The HALO has seen many changes and updates throughout the years including the most obvious, it keeps getting bigger-but this most recent HALO 6 truly breaks away from the past. 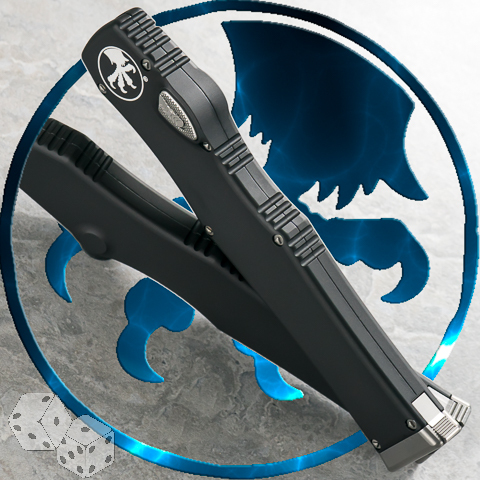 The HALO 6 features a mechanical fire safety system so the knife can be carried without a sheath, past HALO's have shipped with a kydex belt sheath but not this this one. 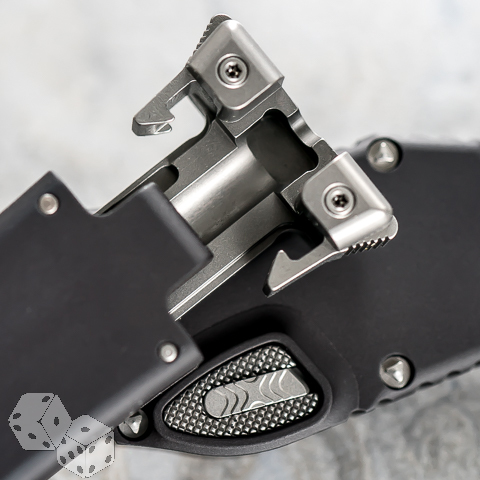 This knife also features a rifle like dual clip release charging handle, to prevent accidental unlocking of the charging handle while in use and allowing the handle to come loose along with the blade. Additionally the HALO 6 has the great looking tear drop style button where the safety mechanism is nested, simply slide back the safety and push the button down to fire the blade. The frame has also been trimmed down and lightened in a few different places as you can see on the reverse of the body the button protrudes from the frame slightly to allow for travel space while thinning the overall girth.